With the demise of Kasur Lodi Gyaltsen Gyari (October 1949 – 29 October 2018), a very important chapter of modern Tibetan history has closed. He was an extraordinary Tibetan, a unique diplomat and a great statesman, who played an effective role in putting back the issue of Tibet on the international agenda, which has been otherwise lying forgotten and hidden from international attention since decades. In the modern-day history of diplomacy there are few diplomats like Lodi Gyari, who performed effectively and delivered stunning results over a long period despite most limiting and unfavourable situations. As a Tibetan he belonged to one of the smallest refugee Diasporas (total population less than 150 thousand across the globe) and represented a ‘government-in-exile’ which does not enjoy recognition from even a single government. Yet, he was able to push the United Nations from its inertia on Tibet; influenced US policies like no non-American could ever do in the USA; and enjoyed more personal access to a wide range of policy-makers on both sides of US Congress and White House than the best of international career diplomats could hope for themselves. He worked as the right-hand man of HH the Dalai Lama, and successfully persuaded members of US Congress from both sides of the aisle to place Tibet at the top of the US agenda despite venomous threats from the Beijing government on anything concerning Tibet. The US Senate passed a special resolution putting on record its admiration for Lodi Gyari’s personal contributions on Tibet. In the latter half of his life Lodi worked from Washington DC, where he was sent by his master the Dalai Lama as his special envoy in 1990. He mainly functioned through the International Campaign for Tibet (ICT), a think tank and advocacy group which he had founded with his Tibetan colleague Tenzin Namgyal Tethong in 1988 in Washington DC. As the President of ICT between 1991 and 1999, and later as the Chairman of its Executive Board in Washington DC until 2014, Lodi successfully won active support from and influenced innumerable statesmen, heads of states, policy makers, think tanks, and advocacy groups from across the world for the Tibetan cause — especially for the human rights of Tibetan people living under Chinese occupation since 1951. In ICT, Lodi Gyari worked with colleagues like Matteo Mecacci and famous Hollywood star Richard Gere. A major achievement of his team was that they were able to get the issue of Tibet institutionalized in the US political system. They successfully mobilized Congressmen from opposing sides of the US Congress to adopt the famous ‘Tibet Policy Act (2002)’. This Act mandated the US government to appoint a ‘Special Coordinator for Tibet’, which provoked Beijing leaders to cross limits of accepted diplomatic norms. It goes to the credit of Lodi and his team that the UN Sub Commission on Prevention of Discrimination and Protection of Minorities passed a resolution on Tibet in 1991 despite all threats and pressures from China. It was no less than a diplomatic coup for Tibet and the Dalai Lama because Beijing had been successfully stopping every single attempt by the UN of even mentioning the word ‘Tibet’, ever since the UN had passed its last resolution 25 years ago supporting Tibet in 1965. He expanded his diplomatic activities beyond the US through ICT offices in Berlin, Brussels, and Amsterdam. His work and reputation grew beyond the Tibet issue as he was trusted and consulted by many world leaders, think tanks, and policy makers on issues as wide as US-China, India-China, and India-US relations. Many career diplomats and heads of diplomatic missions in the US and UN would certify that there have been very few individual career diplomats who have had as clear an understanding of the functioning of Capitol Hill or had as much personal access to its functionaries, including the White House, as Lodi commanded as an individual representative of ‘no government’. Lodi also played an important role in winning friends and support for many other suffering societies and occupied countries like the Uyghurs of East Turkistan (China ‘Xinjiang’), South Mongolia (Ch: ‘Inner Mongolia’), and the democratic movements of Burma, East Timor, and some East European nations, all of whom had little access to the UN or the US systems. On many occasions he made positive contributions to India-US relations and lobbied for Indian interests through direct personal interaction with senior policy makers in the US Congress and White House. Lodi had his own logic behind this pro-India attitude. “As Tibetan refugees who received so much love and support from India, it’s our duty to stand for India and support her whenever the situation demands”, he told this author on many occasions. Lodi belonged to an influential Khampa family of Nyarong in the eastern Kham province of Tibet. In his birth year 1949, China attacked his native Kham province, and two years later when Mao’s PLA occupied entire Tibet, his parents took shelter in India. Lodi was identified as a tulku, viz. an incarnate lama, and received his early education from learned Dharma masters. After modern education in India he gave up robes and took to active social work. Looking back one can say that Lodi was born to create institutions. He played a founder’s role for the Tibetan Youth Congress; Sheja, the first Tibetan newspaper of refugee community; and the Voice of Tibet, now the Tibetan Review, the main news magazine of the Tibetan struggle over the past 48 years. Lodi had his initial training in diplomacy in India as he was picked up by the Dalai Lama as the Cabinet Secretary of the exile government when he was hardly 25 yrs old. It was in this period that Lodi’s inner diplomatic skill found successful expression. In the 1970s, this author was impressed by the ease with which Lodi would mix and rub shoulders with senior Indian stalwarts like Jaiprakash Narayan, Acharya Krpalani, Morarji Desai, George Fernandes, Madhu Limaye, Balraj Madhok, Ashok Mehta, ML Sondhi, PN Lekhi, Major General SS Uban, TN Kaw — name a leader or senior Indian bureaucrat and good chances were that Lodi could call at his or her home within next one hour. In his initial days as an activist political worker, Lodi won elections for the exile Tibetan parliament and soon became the youngest Speaker of the Tibetan House. Later the Dalai Lama inducted him into his cabinet where he served until he was deputed to USA as his special envoy. Later he represented the Dalai Lama as his Chief Negotiator with Beijing from 2002 to 2010. Unfortunately Beijing used this period for fortifying its position inside occupied Tibet and did not allow the talks to succeed. There are innumerable admirers and friends of Lodi Gyari like me who will miss him as a great friend, who lived life in winning friends and influencing people. For coming generations of Tibetan political workers and diplomats, Kasur Lodi Gyaltsen Gyari will be remembered as a doyen and a benchmark. The author is a senior journalist, a Tibetologist, and Chairman of the Centre for Himalayan Asia Studies and Engagement. More articles by Vijay Kranti on Tibet Sun. 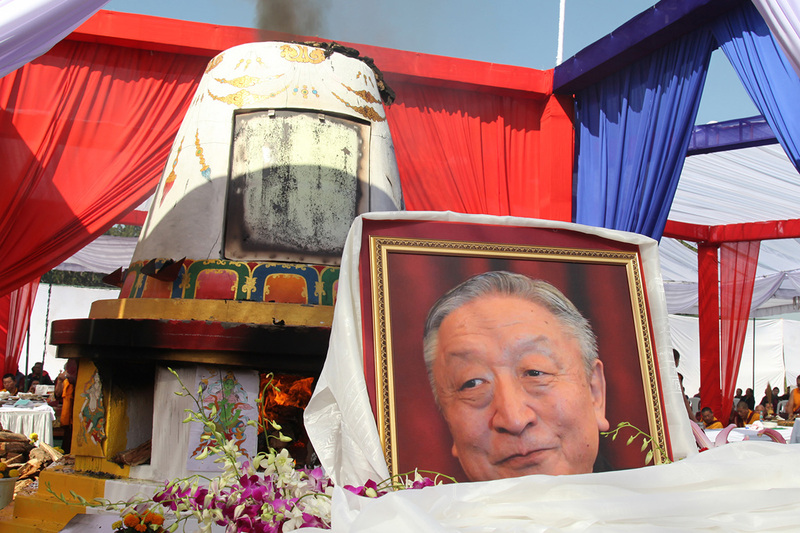 Although we can heap lots of praise after a public persona dies but what happened to 1 or 6 million dollars he is alleged to have pocketed from a Norwegian philanthropist, which was meant for Tibetan refugees. May be Buchung Tsering at International Campaign for Tibet in Washington D.C. would be able to shed a light on this, for he is the closest protege of late Gyari Rinpoche. Buchung Tsering might have benefited from this windfall and so we would never know unless Buchung Tsering sheds some light on this.